Pretty cool, right? Here’s how I came up with the idea, and some of the technology necessary to make it happen. I am an urban car-owner (don’t hate), and I often find myself driving on the BQE, the Robert Moses-era urban highway that winds its way through Brooklyn and Queens. Some parts are elevated, some are set below-grade in a trench. It’s cuts through neighborhoods, leaving rusty pedestrian walkways and dimly-lit “under-the-bridge” dead spaces in its path. Near where I live, it joins with the entrance of the former Brooklyn-Battery tunnel (now the Carey Tunnel), and creates a massive elevated interchange that cuts off Red Hook from the rest of the city. I wanted to see what was there before the highway… As with the saga of Hess’ Triangle, I’m always interested in the scars left on the built environment by interruptions to street grids, widening of roads, landfill into water, etc. However, I didn’t just want to study historic aerials and maps. The idea popped into my head that it would be really interesting to “erase” the pre-BQE blocks on a historic photo to reveal the modern highway and get a better idea of the cost of progress. To be honest, it reminded me of SimCity, where you can demolish whole swaths of land with a click of a mouse. This would be much more than just comparing two aerial images of the same place… it would let the user choose an area to explore, and reveal the differences at their own speed, based on their own curiosity. A CROWD-SOURCED IMAGERY AND MAP ORTHORECTIFICATION PLATFORM FULL OF HIGH-QUALITY SCANS OF 1924 AERIALS OF THE ENTIRE CITY WHICH ALSO SERVES XZY TILES, WMS, AND HAS MANY OTHER OUTPUT FORMATS! 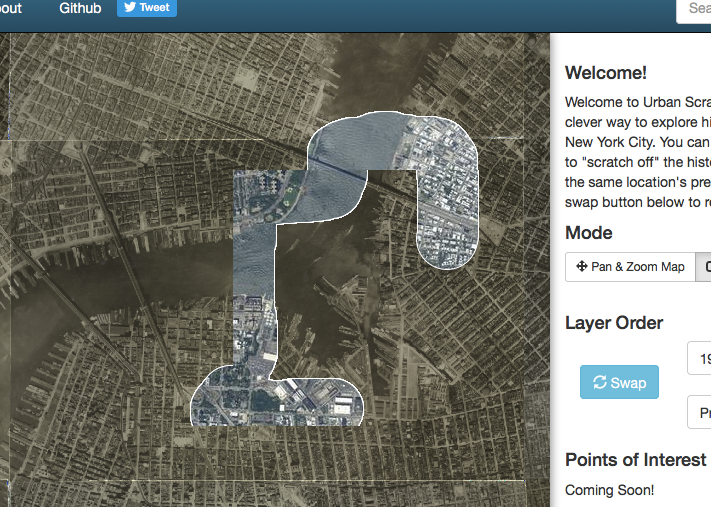 NYPL Labs’ MapWarper is based on Tim Waters’ MapWarper project, an open source web app that allows anyone to create an account and help rectify scans of maps and aerial photos. The library has scanned in hundreds of old maps, and anyone, including you, can login and contribute. I spend a couple of evenings adding more control points to the aerials over Brooklyn to build the proof of concept that would become Urban Scratchoff, and it’s quite fun. You have to find corresponding points on the historic imagery and a modern-day basemap, and with aerial photos that don’t have any labels, that means searching for spatial patterns, landmarks, intersections, and building footprints. Seriously, you can help out… any place on Urban Scratchoff where the streets don’t quite line up is in need of more accurate control points. You can sign to NYPL Mapwarper and improve the tileset. Leaflet Providers is a great resource that catalogs tile layers from around the web that are usable in leaflet.js. Most are basemaps by the likes of Mapbox, HERE, ESRI, Stamen, and my employer, CartoDB. There are a few satellite imagery layers, and the one I chose to use is Mapquest’s Open.Aerial. Here’s a big thanks to them, and everyone else who makes these layers free to use in web mapping projects! Oh look, a jsfiddle called Canvas Eraser that does exactly what I want. Drag your mouse along the gray box below to erase parts of it, revealing an image. The magic that is happening here is the destination-out composite operation, which turns the shape you’re drawing transparent instead of filling it with a color. For more on the composite operations available in canvas, check out this handy Mozilla reference. Finding the above “canvas eraser” fiddle was a Eureka moment, (again, don’t you love it when someone else has already done what you were going to spend a lot of time on and shared their work? It’s a great time to be alive and coding) and the next task was to shove this functionality into Leaflet. The author of the above block could have used leaflet’s built-in SVG circlemarkers or a D3.js overlay to draw all those points on the map, but Canvas lets them do it without choking out the browser. Drag the map, the canvas erases and re-renders, and there’s no need to keep everything in memory. The canvas overlay worked with a static image I had downloaded from NYPL mapwarper. I loaded the modern imagery as a normal Leaflet TileLayer, and added the historic image as a canvas overlay. I was able to reposition the image when the user dragged the map, but it was clunky. Because the canvas overlay was exactly the same dimensions as the map, there was no imagery in the buffer area around the map. When dragging, the user would just see the bottom layer around the edges until the canvas finished re-drawing. The scratchoff functionality worked as expected, but once the user panned the map, the canvas would re-render and the scratched-off chunks would disappear. I needed another solution. Perusing the leaflet docs (a favorite pastime of geo-dorks. Seriously, ask one), I stumbled across TileLayer.canvas. Instead of one big canvas element, it places many 256×256 pixel canvases on the map where normal tile images would go! This solves a lot of the grunt work, as leaflet automatically requests tiles around the fringes of the current mapview to make a more seamless panning and zooming experience. When leaflet loads an empty canvas tile, I just figure out the x/y/z coordinates of that tile, request the corresponding 1924 aerial tile, and then draw the imagery tile into the canvas element using canvas’ drawImage() method. I solved this by checking if the cursor was near the edge of a tile during the drag. If it was, I selected all 8 neighboring tiles and simultaneously drew the same destination-out circle into all of them. This allowed for a seamless scratchoff across tile boundaries. It has been brought to my attention that my fix only worked in Chrome and that the edge problem still shows up in Firefox and Safari. I need help on this one. When leaflet requests a tile from tilecache.lolspec.com, the node app checks to see if it has a saved copy of the tile on my sever. If it does, it serves the saved tile. If it does not, it grabs the tile *once* from NYPL mapwarper, serves to the client, and saves it in the cache. Every now and then I’ll wipe out the saved images so that Urban Scratchoff can benefit from updates that people are contributing to mapwarper. Oh yeah, during the early hacking, I needed a small set of tiles to use locally, so I forked and improved this node-based tile downloader. Check it out if you ever need to download a tileset into an x/y/z folder/file structure. So that’s my Canvas and Leaflet Saga, and the result is an addictive map toy for urbanists and historians. Every person that looks at Urban Scratchoff is drawn to a different part of the city that has some meaning for them. I’ve enjoyed looking over people’s shoulders as they explore the infill of Battery Park City, the world trade center site, the BQE and Gowanus Expressway, Ebbets Field, La Guardia Airport, Brooklyn Bridge Park, Marble Hill, and many more interesting NYC sites. The next step will be to allow anyone to “mark-up” the map with interesting places to scratch along with text description of what’s there. I’ll probably use CartoDB to store and serve the data and leaflet.draw to let users create arbitrary points, lines and polygons on the map to share. If any coders out there want to help out with this, I’d love a hand. Another todo will be to add more cities, and more options for imagery. 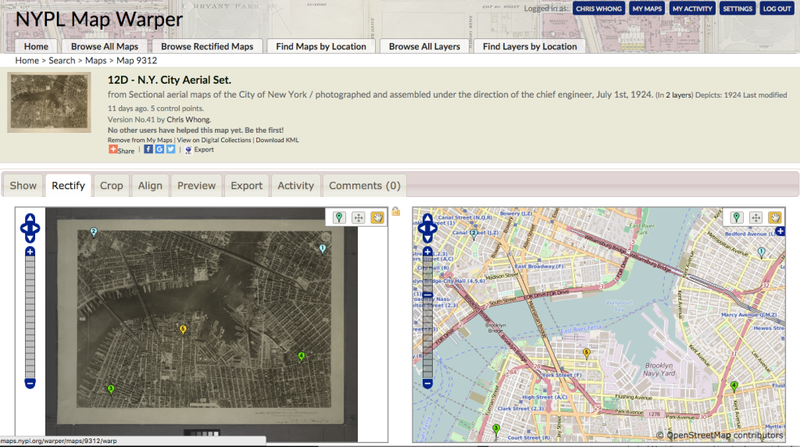 Yet another one will be to link back to images on NYPL mapwarper so users can fix imagery on the spot. I would LOVE to see an NYC historian narrate in real-time as they scratch the map off… screencast it and put in on youtube! Do you know anyone willing to give this a shot? Thanks for reading. The code for Urban Scratchoff is on github for you to fork for your city or contribute to. Happy mapping! 6 Responses to "Building Urban Scratchoff"